Liverpool got their Premier League title charge back on track against Bournemouth. Here's why it was exactly the performance they needed. It was not so much the victory but the manner of it that will satisfy Liverpool supporters the most. Jurgen Klopp's men ran out 3-0 winners at Anfield but it could easily have been more. Much more. The hope now is that this performance will signal a lasting return to form. Not since the end of December - when they thumped Newcastle and Arsenal in the space of a few days - had Liverpool been at their free-flowing best, but this was more like it. Bournemouth can be a dangerous opponent - Chelsea will testify to that - but they could barely lay a glove on them. Sadio Mane was the man to break the deadlock. 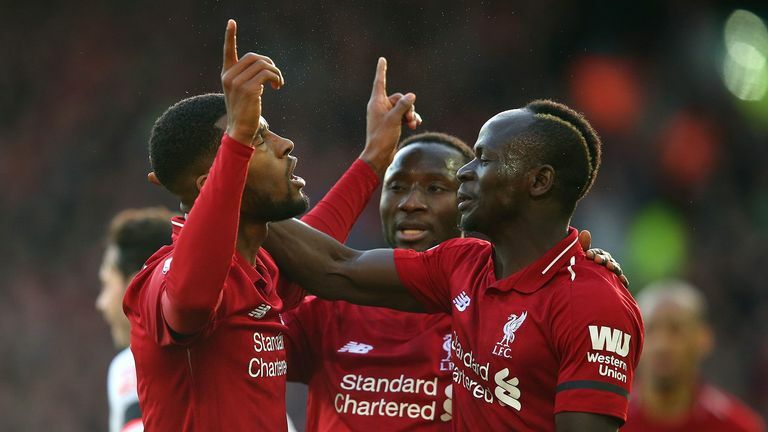 The Senegal international has been one of few Liverpool players to have impressed consistently in recent weeks, hitting vital goals against Palace, Leicester and West Ham, and he was on the spot again to extend his scoring run when he headed home James Milner's cross midway through the first half. Their combination play was dazzling at times, most notably for Liverpool's third goal - a move which involved every member of their attacking trident. First, Mane turned smartly on the ball just inside Liverpool's half and fed Naby Keita, who threaded it through to Firmino. The Brazilian shaped to shoot before backheeling the ball to Salah, who finished coolly. The Dutchman's goal, brilliantly lifted over Artur Boruc, rewarded an unusually adventurous performance. With Keita and Fabinho sweeping up behind him, he registered his highest numbers of the season for touches in the opposition box (five) and shots on target (two). He created more chances (three) than in his previous six appearances combined. Liverpool's free-wheeling counter-attacks and unrelenting intensity made a mockery of suggestions that they had lost their nerve in the title race, and there was impressive defensive focus, too. Bournemouth managed 12 shots but only two of them were on target and none of them were clear chances.